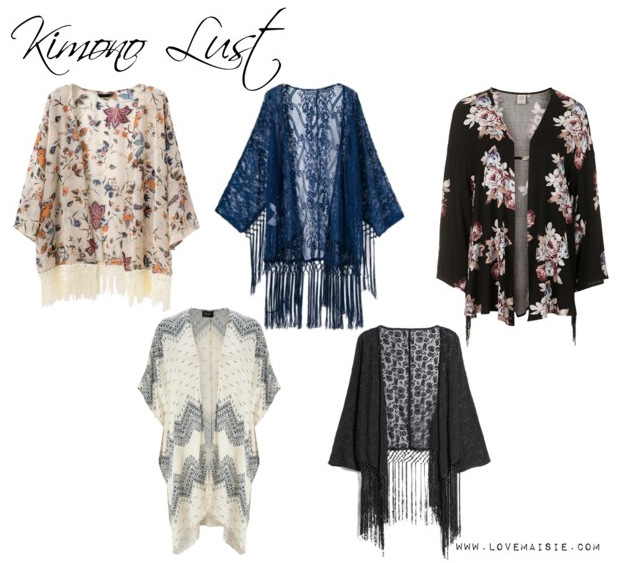 So i’m a little obsessed with kimono’s right now, as is the rest of the world, so I thought i’d pick out my current top 5 and share them with you! PS, if you follow me on Instagram, you’ll know that I made a kimono recently, let me know if you fancy a tutorial! First up is this loose, floral kimono with cream tassels on the trim. I usually go for darker floral prints but there’s something about this lighter print that gives it a really cool vintage feel, don’t you think? This item is from Romwe and is currently on sale for just £11.50! I reckon this would make a fantastic festival piece too. My favourite of the five kimono’s is this royal blue, lace number, holy wow! I think this would look awesome over a white bodycon dress and some sandals in the summer. Such a delicate piece but I really feel that it looks super smart. You can get this kimono from a store called Lucluc (also on sale) for just £16. Of course there’s a Topshop number thrown in there. Probably the most “me” style, being a dark floral print. I like that it has tassels on the arms but not around the hem, I think it adds a nice, casual touch. Being that this is from Topshop, the price tag is a little higher, coming in at £55, but hey, if you can treat yourself.. I totally would! This white and blue print kimono from Lipsy London is perfect for throwing over your bikini at the beach. Or even over a simple shorts and t-shirt combo to jazz a seemingly plain outfit up. Not a bad price either, just £28 from the Vila line at Lipsy, totally worth it. Last up is this floral embroidery kimono from Mango. Again, slightly on the more pricey side. This bad boy will cost you just under £60 which I personally think is way too much for polyester but it does look beautiful! On the Mango website, the model rocks this kimono with a simple black tank top and black jeans which I think looks tres cool but you could wear this over just about anything! So what are your thoughts on kimono’s? Love them or nahhhh? Let me know below! I hope you’re all having a wonderful week so far and remember, keep smiling!